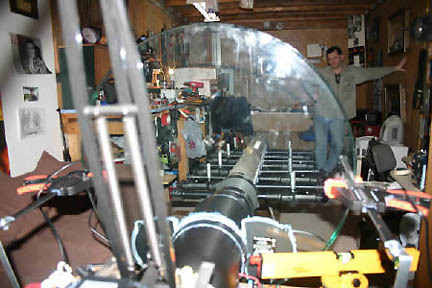 41-year-old inventor and environmentalist, Troy Hurtubise, in his North Bay, Ontario, Canada, home laboratory with his "Angel Light" invention that "sees through walls." Photograph © 2005 by Phil Novak, BayToday.ca. January 22, 2005 North Bay, Ontario, Canada - There are many satellites now orbiting the Earth which help monitor air and water temperatures, glacial melts, hurricanes and dozens of other details in this complex world. Some of the many satellites that orbit our planet also do work for military and defense agencies. Protecting those satellites is vital to national security. But this week, a story from North Bay, Ontario, Canada, says an inventor there has come up with a machine that not only can see through walls, it can stop the electronics in any machine, including high-altitude orbiting satellites and nuclear missiles. Now, according to the inventor, the Pentagon, Saudi Arabia and France are taking notice.